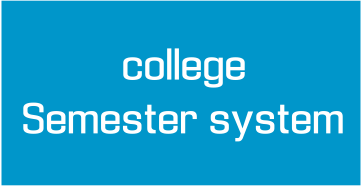 Semester system - Yes or No? It becomes easy to manage the syllabus in the six monthly installments rather than keeping it accumulated for a whole year. Student’s perspective positively rates the semester system. They enjoy several benefits from semester program. · It is easier to manage the studies systematically in short period standards. · Lots of internals and projects within a semester help in gaining good marks without making strict efforts. Yearly exam provides a single opportunity to perform and get through that year. · If a competitive exam falls during the yearly exam, your whole year is at stack, but if there is a facility of semester wise exams, there are less chance of your competitive exam to fall in during both semesters. In that case you have more than one opportunity (including internals) to perform well and maintain your CGPA. · Not only due to competitive exams, other factors like marriage in family, sudden trips, health issues etc would create least impact if the semester system prevails in the structure. · Yearly exams makes student lethargic throughout the session whereas semesters consistently motivates to study and requires your active participation. · Syllabus is distributed in parts which makes it comfortable for students to study and attain genuine learning. This is not in the case of yearly exams. Whole syllabus gets accumulated to be studied and the major focus shifts on tracking the important questions as its difficult to study the whole content in a single go. Students happily accept the semester system and are comfortable adopting it in practical life. But everything never goes on what we desire. To your dismay, administration swirls the red flag to semester and restarted with the annual exams. · They need to arrange for exams again and again if they opt semesters. · It requires arrangement of faculties for invigilation and paper checking. · It saves lots of money when the exams are conducted just annually. · Other formalities, paper work, reporting all that needs to be done frequently in semesters are a big headache for them. · Handling seating arrangements, paper scheduling are all time consuming and require involvement of more manpower. · Besides involvement, proper training and frequents meetings needs to be scheduled. · Faculties have more time to complete their syllabus, and are in no hurry as they have yearly goals and not the semester wise. It’s a big no for students to opt the annual exam structures, but the no is much bigger from the administration. After all they are the decision makers and here we are with annual exams again!